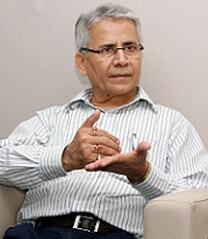 Dr. Ahindra Chakrabarti joined as Professor at Great Lakes on 1st October 2013. Prior to this assignment, he was Director, International Management Institute Kolkata, an Institution set up by Sanjiv Goenka led RP-SG Group. He had taught at Management Development Institute between 1978-96; and at International Management Institute (IMI) New Delhi between 1996-2010. He has worked as Director (2000-02) Institute for Integrated Learning and Management (IILM) New Delhi and as Director General (2006-08) of Fortune Institute of International Business (FIIB). Dr. Chakrabarti holds a Master’s Degree in Commerce from the University of Burdwan; LLB Degree from University of Delhi and PHD from the University of Burdwan. His area of expertise is Financial and Management Accounting; Cost Management; Infrastructure Finance with focus on Energy Sector; Investment Banking and Commercial Banking. He has a number of research publications to his credit. He has handled consulting assignments of DFID, European Commission; ILO and World Bank. He has considerable experience in designing and delivering Management Development Programmes for government departments and corporate sector. He has served as Member ,Task Force of the MOU Committee of Government of India and was Independent Director in Western Coalfields Limited, a Miniratna PSU of the Government of India. Currently he is serving as Member Expert Committee for MOUs of the Department of Public Enterprises, Government of India.